Elizabeth Erardi as Carrie in a scene from the SpeakEasy Stage Company production of CARRIE the musical, running now thru June 7 at the Calderwood Pavilion at the Boston Center for the Arts, 527 Tremont St., Boston. Tix/Info: www.SpeakEasyStage.com Photo:Craig Bailey Perspective Photo. After all, who might dare set to music a Stephen King tale about a tortured young girl with telekinetic powers whose mother is a born-again homicidal nutcake? “Carrie” was skewered during a blink-your-eye quick Broadway run in 1988, but was extensively reworked before an off-Broadway run in 2012. Speakeasy often veers off the beaten track with its “spring musical,”: “Jerry Springer: The Opera,” “The Great American Trailer Park Musical,” are two such offerings in recent years. with interesting characters and witty dialogue. The revised “Carrie” works best as high camp, since the score — or the book, for that matter — don’t really do the job, despite the revisions. Having said that, the story of Carrie White, the classic teen outsider who’s bullied and mocked at her high school, is as relevant today — make that more relevant — than it was almost 40 years ago in Brian dePalma’s movie version of the King novel. Teen alienation has often turned deadly in real life. 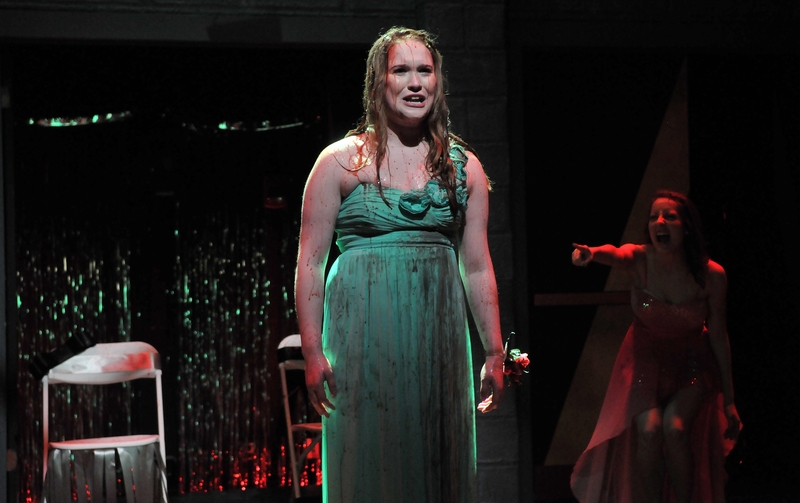 Elizabeth Erardi , a junior at the Boston Conservatory, captures the sweetness of Carrie and her teen angst but is less convincing as the fire-breathing dragon she later becomes. Joe Longthorne as Tommy Ross has a nice musical moment in “Dreamer in Disguise,” and he and Sarah Drake as Sue Snell play the two teens with guilty consciences who try to protect Carrie from the mob, but fall victim to the old saw: No good deed goes unpunished. There are also some well-done special effects and the bucket of pig blood works just fine. God bless Kerry Dowling. She portrayed very different mothers in other Speakeasy musicals such as “Next to Normal” and “Bat Boy: The Musical,” and here, as Carrie’s mother Margaret, her religious fervor helping her to lose touch with reality, she puts the best possible shine on the sneaker that is the Gore-Pitchford score in such numbers as “When There’s No One.” She gives her songs everything she’s got, with the result that some numbers are better than they deserve to be. Shonna Cirrone has some moments as a sympathetic teacher, along with Page Berkovitz and Phil Tayler as Carrie’s chief torturers. Despite the many deficiencies, based on Speakeasy’s sterling past reputation with musicals and the intriguing subject matter, “Carrie” may find its audience and that’s just fine. By the way, on the way out of Speakeasy Stage this month and other area theaters, drop something in the bucket for the Boston-based Theatre Community Benevolent Fund. It benefits people in the theater community who have an emergency or a personal reversal and need the help. Very few jobs in the theater in the area are full-time, and fewer still come with health insurance. The Speakeasy Stage Company production of “Carrie: The Musical.” Book by Lawrence Cohen based on the novel by Stephen King, music and lyrics by Michael Gore and Dean Pitchford. Directed by Paul Melone. Musical Direction by Nicholas James Connell. Choreography by Larry Sousa. http://www.speakeasystage.org.